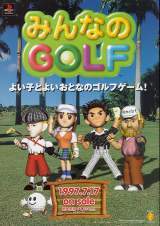 Sony PlayStation Game published 22 years ago by Sony Computer Ent., Inc.
Minna no Golf © 1997 Sony Computer Ent., Inc. Most of us will never be a Tiger Woods, but with Minna no Golf, you can still learn the skills and play the game, without having to cope with a super realistic sports simulation that's too difficult to control. This unique approach to golf offers something for everybody - Minna no Golf!! Released on July 17, 1997 in Japan. [JP] "Minna no Golf [Model SCPS-91126]"
[EU] "Everybody's Golf [Model SCES-00983]"
[US] "Hot Shots Golf [Model SCUS-94188]"